August 24, 2015 August 24, 2015 daenc5 Comments on What’s the “What’s Good Tour” All About? What’s the “What’s Good Tour” All About? Since this is the first post about it, I should explain the project DAE is embarking on. 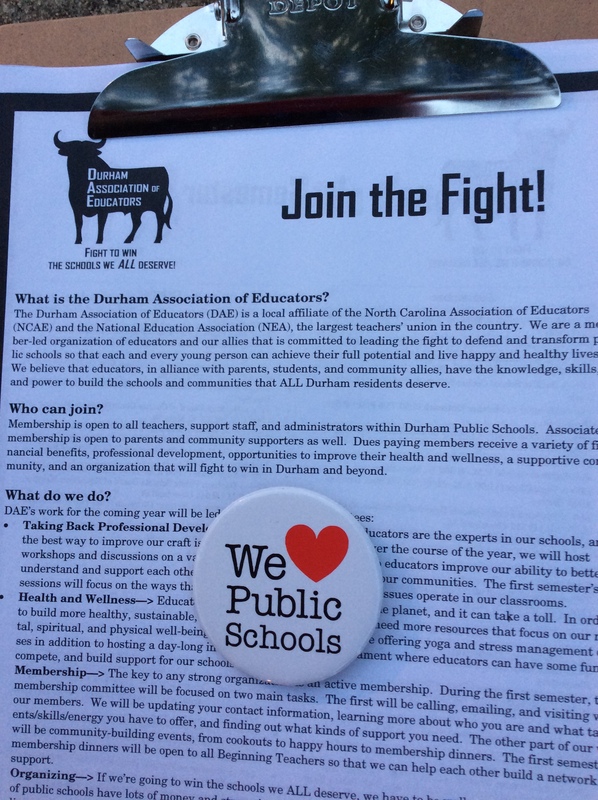 In the first 60 days of the school year, I’ll be visiting every Durham Public Schools school and worksite. The goal of these visits is to study our schools, talk to educators, students, and parents, and preach the gospel of the miracles that occur in public schools every day. For the last 30 years, politicians and corporate reformers have argued that our public schools are failing so that they can impose standardized testing and curriculum, limit the ability of our professionals to lead and create, withdraw funding, let our schools crumble, and come in with profit-generating alternatives when our schools “fail” that do little but leave our students further behind. To be clear, as an 11-year veteran of public school classrooms, I have no illusions about the struggles that our schools have, particularly with meeting the needs of students of color, poor students, students with disabilities, immigrant students, and a host of other marginalized populations. We know this. But we also know that our public schools are the only places that many of these very same kids even have a shot. While charters and private schools have been posed as the fix-all, all evidence suggests that marginalized kids don’t perform any better at those schools than they do in our traditional public schools (there are, of course, exceptions). And without democratic control or oversight, there is no way to hold these schools accountable to educating our children with the tax dollars we give them. We absolutely must transform our schools. And we absolutely must center the needs of marginalized children. But it is A Big Lie to say that our public schools systems are not capable of meeting this goal. The fact is, public schools are the only institutions in our society that are still trying to address the challenges of poverty and racism in our communities. We must defend them. So if we’re going to fight for our schools, we probably need to start by telling the truth about them. The purpose of this tour is to expose readers to the daily miracles performed in our schools and build an argument for the preservation of the most important public institution we have left in the U.S.
Our students deserve the best. We deserve the best. So this year, we start off by highlighting the best that we’ve already got. Buckle up y’all, it’s going to be a fun ride. This is what I call telling our own story. If you haven’t already, please consider sharing this widely in local media and other platforms. I’m a parent of 3 DPS students and I just happened to see this on someone else’s FB feed. While we can acknowledge there are places in our system that demand more focused attention, we must also retain the power to tell our own stories about the many good things that are happening in our schools. There are enough half stories told through test scores, school grades, and the voices of people claiming failure. They don’t paint the full picture. Thank you for your time collecting THESE stories. Also, you can reach me at dae4ourstudents@gmail.com if you’d rather take this to email. I am so excited about this! I had a very difficult time deciding where to send my kindergartener, and I have been second-guessing my choice, not because of the school itself but because of other people’s opinions of the school, even though they have not been personally involved with the school. I can’t wait to read about your visit to my son’s school! Thanks for the comment Lauren. Please advise folks to spend time in the schools before they arrive at an assessment of the places where we love our kids all day long. There is so much awesome stuff going on in every one of our schools. Next What’s Good at Githens?